Every women knows that daunting feeling when a favourite skirt feels tight and the zipper fights closing time. Many find at certain times in life or perhaps with each monthly cycle they retain fluid in the body, but for a lot of women bloating in the abdomen causes most discomfort. 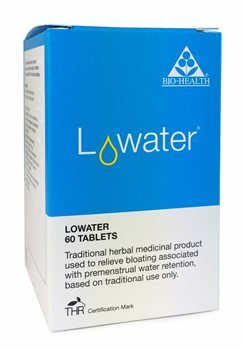 Each of the chosen herbs in Lowater will help to normalise the imbalance of fluid in the body and restore its normal function of elimination. Adults: Two tablets to be taken in the morning and 2 tablets in the evening. The tablets should be taken before the period is expected to start. Avoid taking any medicines during pregnancy and lactation unless prescribed by a doctor. Very fast service. Product does exactly as promised. I feel so much better.